I have always been a big fan of their eyeshadows. This month I have particularly been loving the shades - The quality and pigmentation is just as great if not better than M.A.C shadows. They are very smooth and easy to work with. Also, their foiled eyeshadows are phenomenal, super creamy and the colour payoff is insane. The foiled finish looks almost wet. 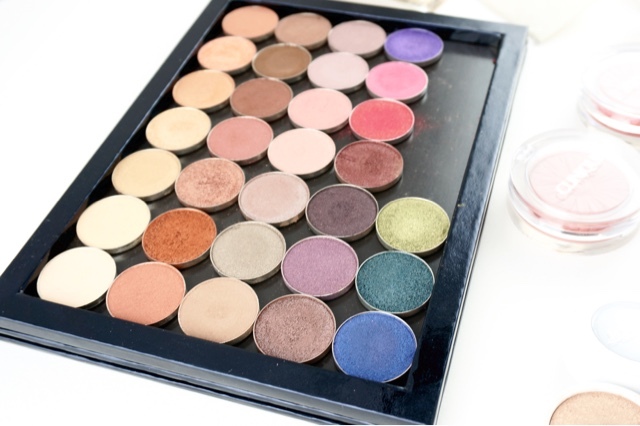 Makeup Geek is definitely one of my favourite brands for eyeshadow. If you haven't tried their shadows, I highly highly recommend you do! These babies are a new addition to my collection. I've been enjoying the flush of colour it gives to my cheeks. Very blendable and easy to wear for everyday, it almost gives a slight sheen/glow to the face. The clear acrylic packaging is very sturdy and doesn't feel cheap at all. And how could I go on without mentioning how adorable the blush looks! These blushes are embossed in the shape of gerber daisies. I now own four shades from the range - Ginger Pop, Peach Pop, Berry Pop and Fig Pop (my favourite at the moment!). After falling for ColourPop's eyeshadows and blushes, I already knew I would love their highlighters just as much when I saw photos of them flooding the beauty world. And was I wrong? I have a mini size of Wisp and it is absolutely amazing! 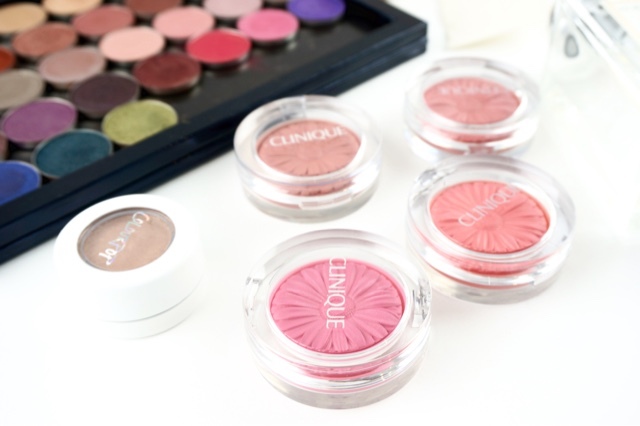 The texture is just as silky and creamy as their eyeshadows, it feels almost wet to touch. I usually apply with my fingers and just dab it on the high points on my face, you can also use a damp sponge if that's what you prefer. This tinting balm is something I purchased when I was in Korea last year. I remember trying it straight away and loved it so much that I went back to the store and picked up a few extra shades the next day. These are very pigmented and they leave a sheer tint on the lips after the balm wears off during the day. I sometimes dab it on my lips for a lighter application, a less bold lip colour. They have the texture of a lip balm and they are like a hybrid of the Revlon Lip Butters and Kissable Balm Stains but with better moisturising and nourishing properties. I've been using this mask since last year and I really like the texture and the scent of it. Every time I use it, it gives my skin a boost of moisture and I instantly feel that my skin is softer and brighter. Manuka honey is very beneficial for the skin. It has antibacterial, soothing and hydrating properties that can help to calm irritating skin conditions - redness, acne and dryness. I'm almost out of mine, and I love it so much that I have already purchased a backup. This was a random purchase when I was in need of a lip balm and I don't have my Lucas Papaw Ointment with me. I didn't think I would love this as much as I do now, I use this every morning to prep my lips when I'm doing my makeup. It keeps them soft and hydrated without feeling greasy or thick. And I am in love with the scent! If you didn't know, I love eating mangoes! The scent of mango is just very refreshing in the early morning. I love it! Last month I was loving the Lumi foundation, I still love that one when I want my skin to look glowy and luminous, but when I want a more satin matte finish, I've been reaching for this foundation a lot. It does have SPF, which is always good to have for everyday. 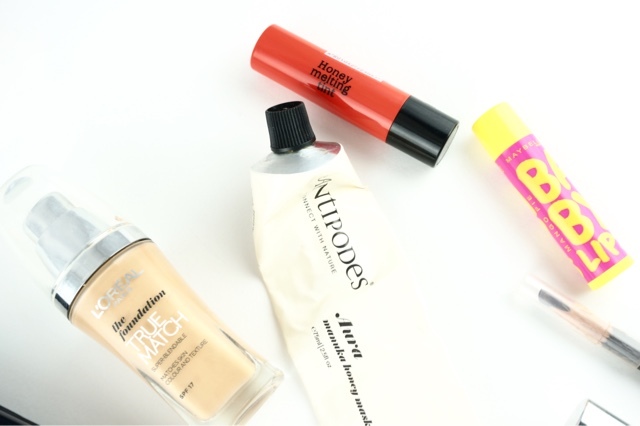 The coverage is medium to full and it is definitely buildable. The finish looks so smooth and natural on my skin. And when I'm having a good skin day, my face looks almost flawless with just one pump (one layer). For your reference, I'm in the shade W3. I've had a hard time finding the right eyebrow pencil in the past, some of them either don't last throughout the day or they make my brows look like two fuzzy caterpillars. My Shu Uemura eyebrow pencil is always specially sharpened by their staff to a tapered flat angled tip, which resembles a sword. The shape of the pencil makes it easier to fill in my brows to the right angle and shape. The formula is quite hard and less waxy than some eyebrow pencils, so if you like the natural brow look, this is worth checking out. 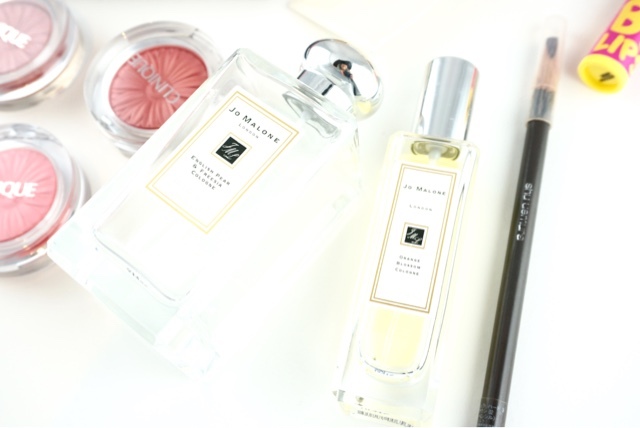 Even though it is still winter in Melbourne, I've been loving to layer English Pear and Freesia and Orange Blossom. These two colognes alone are both very delicious and unique scents. English Pear and Freesia is sweet while Orange Blossom is more citrusy. When the two of them mix together, they become the perfect fruity, refreshing and slightly floral perfume for everyday. This combination has been my go-to for the month when I don't have a specific perfume that I want to wear.